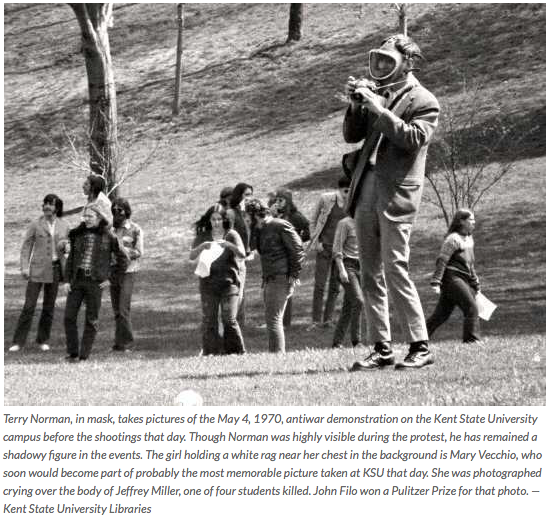 Terry Norman is seen here wearing a gas mask and photographing anti-war protestors at Kent State in Ohio. He was an FBI informant and was most likely the source of bullet shots which spooked the National guardsmen called to come to Kent state by Ohio's governor resulting in them firing upon and killing four students. The FBI has refused to release any records they have concerning their relationship with Terry Norman.